Apple’s holiday deals: a sign of weakness, or a clever move to boost revenue? In November, Apple said unit sales of iPhones — products consumers typically line up for — had barely budged from a year earlier. For more than a decade, consumers couldn’t get enough of Apple’s beloved smartphones. But that may be changing. The latest hint comes from Apple itself, which during the Christmas shopping season is offering trade-in deals on its newest phones. It’s just one of many signs that have sent Apple’s stock reeling: The shares have lost a quarter of their value since October. Does all of this add up to a fateful turning point for Apple? Perhaps — and that might not be such a bad thing. Consider the fate of Microsoft Corp. Once the world’s dominant tech company, it spent the past decade or so as an industry laggard, as desktop computer sales leveled off. But last week, Microsoft briefly surpassed Apple as the world’s most valuable publicly traded company. That’s mainly due to Microsoft’s hugely successful transition to cloud-based corporate computing services, such as Office 365 and Azure. Apple is in the midst of a similar transition, as it derives a large and growing share of revenue from online services such as app sales, cloud storage, and streaming music. The easiest way to sign up new customers for those services is to put iPhones in their hands, even cheaper used models, resold by Apple and other vendors. And that could make these old phones worth a lot more to Apple than their trade-in value. In the near term, the company will sell more iPhones by increasing the trade-in rebates to customers under its GiveBack program. For instance, before Thanksgiving, I could get $100 off a new iPhone by trading in my three-year-old iPhone 6S. But for a limited time, the phone will be worth $200 off. If Apple’s having trouble moving merchandise, it’s not alone. The entire smartphone industry has hit a plateau. In 2017, worldwide sales of 1.53 billion phones was a minuscule increase over the 2016 level. As with PCs and tablets, nearly everybody who wants one has one. From here on, it’s a replacement market. And millions of iPhones don’t need replacing. The newest iPhones are fine devices, but not much better than last year’s. And boy do they cost more. The flagship XS phone carries a starting price of $1,100. That’s a good reason to hold back. In November, Apple disclosed unit sales of iPhones had barely budged from the year before, despite the launch of the XS. And soon thereafter, three electronics companies that supply components for the iPhone each warned shareholders that they were selling a lot fewer parts than expected. None of the companies fingered Apple by name, but the reports convinced a host of Wall Street analysts that iPhone sales are sluggish. 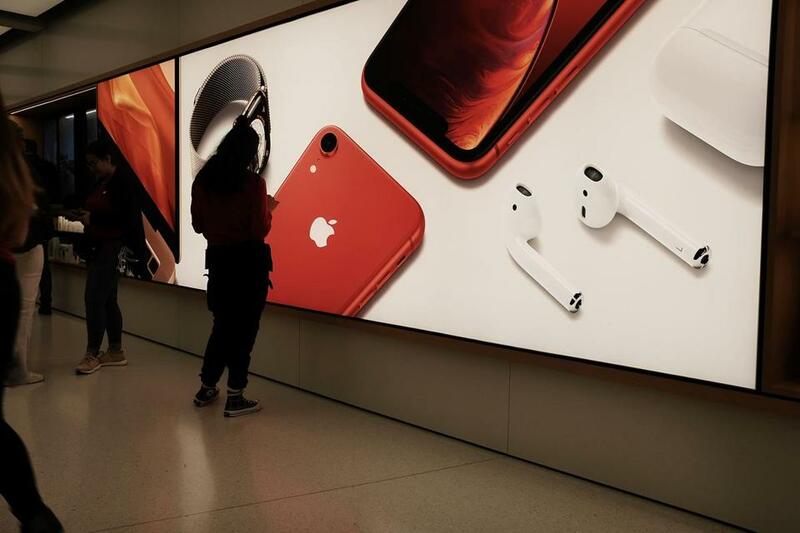 And one more thing: Apple stoked the suspicions by declaring that it will no longer reveal how many of its various devices it sells each quarter. This goes for iPads and Macs, as well. But it’s iPhone sales we care about, since they generate about two-thirds of Apple’s revenue. In all, there are plenty of reasons to fret. Still, the whole thing does have a sort of “Groundhog Day” feel to it. Haven’t we seen this before? Yes, and recently too. Just under a year ago, Apple’s stock was falling amid reports that the Apple X might not be selling quite as well as expected. One report had Apple slashing production by 50 percent. The reports weren’t entirely wrong; iPhone sales were in fact soft. But so many customers bought the company’s most expensive model, the iPhone X, that revenue surged anyway, to about $88 billion. But there’s a significant difference this time. The higher trade-ins mean lower prices for many of the phones Apple sells. Apple wouldn’t sacrifice this revenue unless sales were weaker than expected. Still, Apple isn’t cutting prices across the board. And the higher trade-in levels apply only to older Apple phones, which are worth a lot more to Apple than you might think. According to the Hong Kong market research firm Counterpoint, the market for used, refurbished phones grew 13 percent last year, even as the overall market barely grew. They now make up about 10 percent of the world smartphone market. And they give Apple a clever way to sell its products into the low end of the market without eroding the prestige of its high-end products. There are already plenty of refurbished iPhones for sale; Apple sells its older iPhone 7 for $549, but a refurbished edition costs $80 less at $469. Other retailers charge even less; Amazon.com offers the same used iPhone for $320. Whether they’re sold by Apple, Amazon, or anybody else, lower-cost iPhones tap into a market of less-affluent consumers, people who usually buy cheaper Android phones. Give them a good, affordable iPhone instead and they become prime targets for Apple’s fastest-growing business. Like Microsoft, Apple is moving into the cloud. Apple’s online businesses, such as Apple Music, the Apple Pay payment system, iCloud data storage, and the App Store, are huge and booming. In fiscal 2018, they brought in $37 billion, up more than 54 percent from 2016. Anyone who owns an iPhone is a potential customer. You may not be able to afford an iPhone XS, but you can probably purchase an occasional game app or a subscription to Apple Music for your refurbished iPhone 7. There’s no way Apple can sell iPhones as fast as it once did. But if it can follow Microsoft’s lead and grow its services business, it won’t matter. Peak iPhone? Probably. Peak Apple? Don’t bet on it.